Gender and sexuality are two of the most relevant topics in popular culture today. After 37 years of operation, Exodus International will be closing its doors, according to CNN. The media is pressuring outspoken believers to be 'tolerantly' silent about these issues, which are also their particular distinctives. This section will not hold a great deal of text outrightly. Rather, I would like to direct your attention to a few particular texts that can help believers who struggle with identity issues, and the like. Comiskey, A. (1989). Pursuing sexual wholeness: How Jesus heals the homosexual. Lake Mary, Fla.: Creation House. Comiskey, A. (2003). Strength in weakness: Overcoming sexual and relational brokenness. Downers Grove, Ill.: InterVarsity Press. Payne, L. (1981). The broken image: Restoring personal wholeness through healing prayer. Westchester, Ill.: Cornerstone Books. Connie Podesta's approach is meritorious, but it has one major flaw. She only seems to harp on the women in this video. Of course, the titles gives us the hint that she will probably do this in the video, but her perspective is horridly imbalanced. "You have a scale get on it!" This is too 'pull yourself up by the bootstraps'. Ultimately, not the best resource for 'what not to do'. Pastor Evans has produced a plethora of information regarding marital conflict resolution. His perspective is a bit too 'glowy' and squeaky clean for me, but I do believe that there is some merit to what he presents here. While this is not a treatise on interracial marriages, I do feel that these images and videos help us understand the difficulty that comes with interracial marriages. It seems that a lot of the struggle comes from outside sources. I do not believe that the union of the two creates strife because of differences, as I do the fact that family members, the media, and some religious figures pressure us otherwise. John Piper's sentiment on our discourse is appreciated, but I find his framework to be continually problematic. 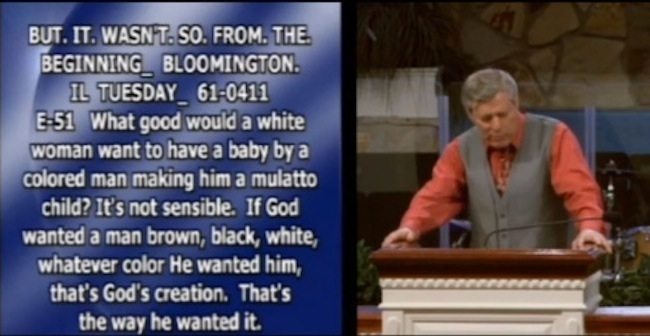 He approaches the theme with the idea that the Bible 'permits' interracial marriage. This is already headed in an unfavorable direction. The use of the word permits seems to imply that God's 'original' intention was for homo-racial marriage, but He will allow mankind to behave in this way. Again, in this case, homo-racial marriage is given the upper-hand. Tia and Tamera discuss the trauma dealt with as a result of Tamera's interracial marriage. 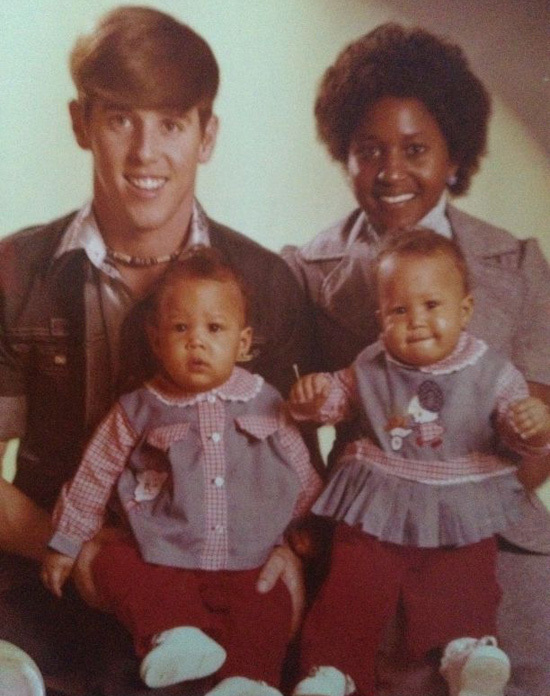 The interesting point that Tamera makes, is that they were used to thinking about their parents as just that--parents. There was not really a concept of Black and White, going to show that this idea may be more culturally-instilled. For a moment, they seem to be the perfect African-American family. Two successful parents, and a beautiful set of twins. Yet, this ideal relation only exists in TV land. 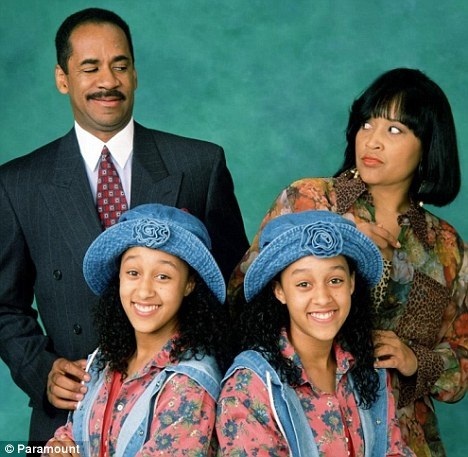 This photo captures the gut-busting whit of this family on the hit TV series Sister, Sister, which ran for an incredible 6 seasons. Galatians 3:28 says, "There is neither Jew nor Greek, there is neither bond nor free, there is neither male nor female: for ye are all one in Christ Jesus." This preacher's ideas about race are informing his theology rather than a biblical understanding of oneness in Christ Jesus. Let's talk for a minute about celebrity interracial marriages. Tia and Tamera Mowry are two quite interesting examples. Who are their parents? "...no matter how torn up the road has already been, or how pothole-infested it may look ahead, nothing – nothing – is impossible for God."